The Carrickfergus RUC annual charity indoor bowling tournament raised �1500 for the Philip Hunter Appeal Fund. Supt. Rodney Lurring (left) presented the cheque to Robert Hunter. 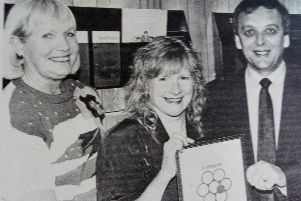 Included are station sergeant Mark Caruth and tournament organiser Eddie Wilkie, 1991. TheCarrickfergus College group which won the Recorder Ensemble plaque at Ballyclare Festival. 1991.